Brazil, the largest country in South America which dwarfs its neighbors, is a country of stunning beauty and a long and interesting history. Just some of its multicultural background stems from Portugal, the Netherlands, France, and Africa, not to mention the amazing culture of its native inhabitants. Brazil is so enormous, it would be impossible to see everything on one trip, but visitors will enjoy carving out their itineraries from the seemingly hundreds of possibilities. Those with a love for history will want to visit Ouro Preto, which was founded at the end of the seventeenth century and was the setting off point for the country’s gold rush, Olinda, which was founded by the Portuguese in the sixteenth century, the historical city center of Salvador, Brazil’s first capital, or the historical center of Sao Luis, which was founded by the French and later occupied by the Dutch. Those that wish to meet and learn about Brazil’s native population can look into the country’s up and coming ethnic tours. Nature lovers may have a difficult time choosing from so many different landscapes ‘ from canyons to rainforests, Brazil offers nearly every sport one can think of for adventurous travelers. Domestic flights are a little on the high side price-wise but are nearly a necessity with how large the country is. Three major airlines offer an Airpass, which may be a good option for those that intend to thoroughly explore the country. Unfortunately, trains seem to be on the wane in Brazil, but buses are going strong and are the main long haul method of transportation for locals and tourists alike. Major gateway airports in Brazil include Rio de Janeiro and Sao Paulo, which regular flights arriving from Miami, New York, Los Angeles, plus several cities in Europe and in South America. International buses travel between Brazil and its neighbors Uruguay, Paraguay and Argentina. Find flights to Brazil here. There is truly something for everyone in this diverse country. Whether tastes run toward the five star luxury end or just needing a place to store luggage while they’re out having a great time, there is a wide range with suitable accommodations for every traveler. 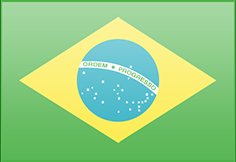 Find hotels in Brazil here.